on all TVs $1299+ with your Conn's Credit Card between 4/14/19 & 4/20/19. Equal monthly payments required for 24 mos. 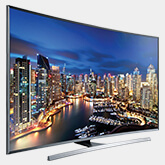 Up to 35% or More Off TV Green Deals! Save on Appliance Green Deals! Save Green All Month Long! 19.99% APR for 36 Months on purchases of this product with your Conn's Credit Card made between 01/01/19 and 12/31/19. 36 Fixed Monthly Payments Required. Offer applies only to single-receipt qualifying purchases. Interest will be charged on promo purchases from the purchase date at a reduced 19.99% APR, and fixed monthly payments are required equal to 3.7158% of initial promo purchase amount until promo is paid in full. The fixed monthly payment will be rounded to the next highest whole dollar and may be higher than the minimum payment that would be required if the purchase was a non-promotional purchase. Regular account terms apply to non-promotional purchases. For new accounts: Purchase APR is 29.99%; Minimum Interest Charge is $2. Existing cardholders should see their credit card agreement for their applicable terms. Subject to credit approval. Monthly payment shown is equal to the promo purchase price (excluding [taxes and delivery]) multiplied by 3.7158%, rounded to the next highest whole dollar, and only applies to the selected financing option shown. If you make your payments by the due date each month, the monthly payment shown should allow you to pay off this purchase within the promo period if this balance is the only balance on your account during the promo period. If you have other balances on your account, this monthly payment will be added to the minimum payment applicable to those balances. With 13 Preset Dry Cycles, there's a cycle for almost everything on this Samsung 7.4 Cu. Ft. Electric Dryer. The Samsung 7.4 Cu. Ft. Electric Dryer has Multi-Steam Technology, featuring powerful and flexible steam options that reduce and remove wrinkles, static, odors and bacteria. (W x D x H): 27" x 30" x 46"
Multi-Steam Technology features powerful and flexible steam options that reduce and remove wrinkles, static, odors and bacteria. With powerful and flexible steam options, you can reduce and remove wrinkles, odors, bacteria and static. Unlike other steam dryers, which require users to manually refill a water reservoir, Samsung’s Multi-Steam Technology requires no refills. Now you can confidently steam away wrinkles and spend less time ironing. Save money and energy with this dryer. It uses up to 25% less energy per load of laundry. Sensor Dry uses sensors to measure the level of moisture in your laundry. It automatically stops the dryer when your clothes are dry. This dryer diagnoses and troubleshoots problems, offering solutions straight from your smartphone. This dryer take care of all of your family's laundry needs, and then some.